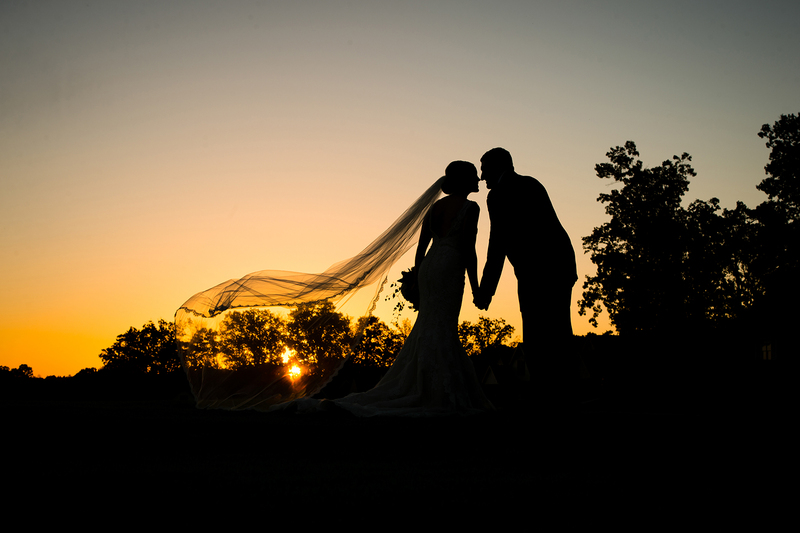 We always strive to create at least one silhouette shot of the bride and groom on their wedding day. It is a timeless and simple photograph that they can appreciate for the artistry in addition to it being a personal and special moment. And a silhouette photograph is actually one of my favorite photos my parent's wedding photographer took on their wedding day. This image was created on Brock and Jared's wedding at Cross Creek Plantation in Seneca, SC--about a 45 minute drive from Greenville. The green lawn behind the country club overlooks the golf course and setting sun is a favorite location of ours for wedding photographs. The bride and groom are holding hands and leaning in for a kiss as the wind catches the brides lace lined veil. You can see the round orange glowing sun sinking over the horizon behind the trees. We got down low to the ground so that we could photograph the bride and groom in the orange and yellow twilight sky.